Located in the south-west of Phillip Island, this walk follows the shore and leads to the top of a cliff, from which visitors will have an amazing view of the SS Speke shipwreck and the ocean side of the island. This walk requires a good level of fitness, as parts can be steep and sometimes slippery. Phillip Island has many interesting walks for nature lovers to experience, but to me this particular one stands out as it not only offers spectacular ocean views, but also a glance at history. On February 22 in 1906, the SS Speke, heading from Peru to Geelong, crashed onto the reef east of Kitty Miller Bay due to faulty navigation, forcing its crew to abandon the ship. More than a century has passed, but remains of the ship close to the shoreline remind the walker of the unfortunate accident. The walk starts at the Kitty Miller Bay carpark. From there, the walker needs to journey down to the beautiful horseshoe-shaped, sandy beach that surrounds the Bay and head east. At the end of the beach, a path in-between the rocky shoreline and an open grassland gradually leads to the top of a cliff. It is only at this point that the shipwreck finally becomes visible, or at least what remains of it. Part of the bow lies on its side on the rock shelf. The SS Speke was one of the biggest ships of its kind, over ninety metres long, but the elements disintegrated most of it shortly after the crash; only a few other pieces of debris remain scattered along the shore. As well as these remnants of the past, spectacular ocean views will not disappoint. Reaching the wreck at ground level can prove challenging at times. A steep path that is not always well defined leads to the beach and can be slippery, especially after rain, so adequate shoes are required to reach the beach. The curious visitor will gather more information on the wreck’s specifications, and its tragic ending, thanks to the interpretive signage at the bottom of the cliff. Access is easier at low and mid tide, where the rest of the beach also remains accessible for a stroll or a picnic. Seabirds are often spotted here and beach wanderers will spot all kinds of marine treasures – shells, sponges, cuttlefish bones, driftwood. However, high tides offer great photo opportunities of the wreck as well. The whole walk is about two kilometres in length, and takes around 1 to 1.5 hours depending on fitness level and on how far along the beach the walker wants to venture. It is always advised to check the weather and the tides beforehand. Although it can be challenging, this walk remains one of the most unique on Phillip Island. Kitty Miller Bay is also a great snorkelling spot, so depending on how much time you can spare and on the tides and weather, it is also worth a splash. Have more time on Phillip Island? Read about some other wonderful walks here. Steep path which can be slippery at times; good level of fitness and adequate shoes required. Check the weather and tides before embarking on this walk. Located on Phillip Island’s Cape Woolamai, this two-hour walk allows visitors to experience a beautiful sandy beach, follow the tops of the cliffs, and finally get down to the bottom of the impressive rock formations displaying vibrant colours. It immerses the bushwalker in a seabird and shorebird heaven. Walkers need to check the weather and tides, and possess a good level of fitness. Cape Woolamai, located on the south-east side of Phillip Island, is most famous for its amazing pink granite formations; the best place to admire their beauty is from the Pinnacles. Leaving from Melbourne, it is only a two-hour drive to Cape Woolamai. The walk starts at the Cape Woolamai car park on Beach Road where a set of stairs leads to a beautiful sandy beach that is popular with surfers and beachgoers. Access is easier at low tides and can be limited during high tides, where the water reaches the bottom of the cliffs in some places. A variety of seabirds and shorebirds can be spotted here, including the rare Hooded Plover, which uses the beach and sand dunes to nest. Be careful if you’re lucky enough to spot one, as these vulnerable birds are easily disturbed and it’s always best to avoid getting too close for their protection. After windy days, keen birders are not unlikely to spot petrels and albatrosses from the beach with binoculars. The walk on the beach takes about 30 minutes, and stairs at the end of the beach take bushwalkers to the top of the cliffs. The path leading to the Pinnacles at the top of the cliff is the best place to observe Swamp Wallabies and occasional birds of prey hunting for their next meal. Breathtaking views of Cape Woolamai Beach are one of the highlights of the walk, particularly at sunset. This part is relatively flat and easy, and from the top of the stairs it takes approximately 20 minutes to reach the famous granite colonnades. Stick to the path, though, for your safety and for that of the birds, as this is shearwater, (or muttonbird) territory, and a high number of burrows make the soil unstable. After hatching, chicks are home during the day and burrow collapses can be fatal to birds. Reaching the tip of Cape Woolamai is a memorable moment as the concealed pink rock colonnades - signs of powerful erosion - finally reveal themselves. A path that is not very well-defined leads right to the bottom of the formations. (Be careful - this part is slippery and requires runners or hiking boots, and should not be accessed in rough weather. Make sure you stick to the path at all times.) The perspective from here makes the formations appear even more impressive. The rocks can be slippery because of sea spray but wandering on the beach will not disappoint. I can personally spend hours here, listening to the waves crash onto the rocks and feeling the sea spray on my face while surrounded by vibrant colours, the blue-green of the sea contrasting with the pink-red of the granite. The Pinnacles Walk is part of a longer set of walks that surrounds Cape Woolamai, including the Beacon, the Lookout, and the Old Granite Quarry. This walk is approximately a two-hour return; the whole Cape Woolamai circuit is more suitable for adventurous bushwalkers with more time to spare, as four to five hours are necessary to complete the loop. Have more time on Phillip Island? There are plenty of other wonderful walks to choose from. Steep path which is slippery at times. Good level of fitness and adequate shoes required. Scenic path on top of cliffs. Check the weather and the tides before embarking on this walk. Alongside the historic gold town of Beechworth in the state’s north-east, a steep gorge cuts deep through the granite. As the gorge falls away from the township, the water plays along a series of natural waterfalls and human-made races and sluices - scars from another century. Though many parts of the gorge are accessible for walks and swims, a wonderful place to escape the summer heat is Woolshed Falls, six kilometres out of town. Less than 100m from the carpark you will find the falls, water cascading across a wide granite slope and pooling at intervals into convenient little spas. Lose your shoes and take your time walking carefully down the slope to find yourself a pool to sink into. With a broad-brimmed hat and a shirt to protect you from the sun, you can rest in a private pool and turn your attention to the little skinks and dragons scampering across the rock faces. Charming little Southern Water Skinks slink and dart around by turns, ambushing or chasing down native flies and wasps. Well-accustomed to the presence of swimmers, they will come close in their foraging and clamber all over your towels, even using them to hide in. During a walk along the woodland tracks, quick Jacky Dragons may reveal themselves, scattering away from your feet. With camouflage this good, they need to be quick to avoid being trodden on. Thousands of miners lived in this small area during the mid to late 1800s when the region was in the thick of the gold rush. Signs describe the massive earthworks that went on here, redirecting the course of the creek by carving deep scores into the hillside. While the valley played host to the workers’ tents and lodgings, almost every tree was felled. The woodland that stands here today sprang up to cover all but the most permanent traces of the miners, showing an amazing recovery over the last century. Here, you will find a woodland dominated by Callitris native pines and three eucalypts – Red Stringybark, Red Box and River Red Gum. Along the paths, Goodenia, lilies and orchids may be found. In summer, the woods ring with the buzz of various cicadas, and common brown butterflies fill the air. In the crevices across the falls, the pretty Austral Stork’s Bill clusters while dragonflies and several types of jewel-like native wasps flit around in search of prey. The melodious calls of Rufous Whistler and Grey-shrike Thrush are welcome company as White-throated Treecreepers cling to the trunks and small birds like Yellow Thornbills and Yellow-faced Honeyeaters play in the canopy. Undoubtedly in winter, the splashing sounds of summer will be replaced with the calls of scores of native honeyeaters, chasing the winter flowering. The falls will be no less beautiful, and the relief of sinking into a cool pool will be replaced with the relief of visiting in the peace of the off-season. This walk will please those seeking nature, a swim, gorgeous views, and a peek into the historic gold rush era. Though the falls can become busy in the summer, the natural pools spread people out and ensure you can always find somewhere cool to escape. Located six kilometres from Beechworth in Victoria's north-east. Cool down in summer by taking a dip in the small pools surrounding the falls. A variety of reptile and bird species. This is a guest post by Monique Winterhoff. There is nothing quite like the challenging climb of Mount Oberon, where the summit rewards avid walkers with breathtaking views across Wilsons Promontory National Park and over some of the outlying islands. This incredibly popular walk begins at the Telegraph Saddle carpark, a four-kilometre drive from the Tidal River campgrounds and approximately a three-hour drive from Melbourne. It is a relatively steep 3.4-kilometre track. For the most part, the walk is on a wide, compacted gravel track used by management vehicles until you reach the stair section just before reaching the summit, which consists of some steep steps. Along the track are glimpses of the view to come and a wonderful walk through the outstanding flora and fauna that the Prom has to offer. After making the final ascent, walkers emerge out onto enormous weathered boulders and have 360-degree views across the Prom and Bass Strait. Even in summer, the weather at Mount Oberon can be windy, cloudy and cold, so be sure to check weather conditions ahead of time. A relatively steep 3.4-kilometre track. Spectacular views of Wilsons Promontory. A variety of local flora and fauna. Be sure to check weather conditions. Tim Brown of the Wild Melbourne Productions Team reveals the breathtaking views from the Mount Oberon Summit in this short video. This is a guest article by Michael Smith. October is an ideal time for a gentle walk in the countryside. The extreme heat of December has not yet arrived and you can enjoy wearing some light clothing. I say, what a fantastic time to visit Northern Melbourne for a bushwalk! About an hour north of Melbourne city, there is a smallish community nestled between Hurstbridge and St Andrews called Smiths Gully. Within this district there is a bushwalk, which begins at Peter Franke Reserve and follows the Smiths Creek all the way to St Andrews. The return walk takes 1.5 hours and is 3km long. The vegetation along the creek consists of regrowth from two significant events. In the mid 1850s, gold was discovered in Smiths Gully, which convinced thousands of miners to try their luck. As a result, many trees were logged to create shelters and a community was built. After regeneration was well underway, a fire further decimated the bushscape in 1962. Today, the gully has a diverse array of plants and ecosystem layers. This is thanks to the eucalypts which provided offspring following both events, due to birds and mammals dispersing seeds from nearby land and the efforts of the local Landcare group to conserve native vegetation. As soon as you begin the walk, it becomes evident that spiny-head mat-rush dominates the understory along the lower slopes. Don’t be fooled though, as hints of purple and yellow can also be found. Love creeper twines around the mat-rush searching for light, and waxlip orchids pop up where space allows. As you encounter more disturbed areas along the track and the northern fence line, the glossy yellow leaves of native buttercup and Austral bear’s-ear become commonplace. Take time to look for pollinators when you find a decent buttercup patch. The wide petals provide an excellent landing zone for hover flies, Lasioglossum bees and native ants. In conjunction with nectar and pollen, buttercups are irresistible for many insects. Within the midstory of the slopes, thorny plants such as prickly moses and sweet bursaria are dotted about. Scrubwrens and fantails can be seen darting to and from these trees. These birds feel comfortable feeding on the food provided by prickly shrubs because predators are less likely to risk receiving a thorn in their side. One of the most magnificent facets of this walk is the array of tall canopy trees that you can see in one glance. Within the forest foothills, narrow-leaf peppermint, swamp gum and the ghost-like trunks of candlebarks tower over the ground story. Alongside silver wattles, these trees provide food and resting perches for honeyeaters and insectivorous birds. White-eared and yellow-faced honeyeaters, as well as spotted pardalotes can be heard regularly, providing a beautiful melody on your gentle walk. As the track winds down the slope and closer to the riparian zone, the vegetation changes slightly. Swamp and manna gums now become the dominant eucalypt, and tea-tree adorns the riverbank midstory. Common froglets make their home in this zone, and their call, not unlike a ratchet, can be heard in October. At regular intervals along the track, signage boards explain the unique relationship that the Indigenous people have with the Smiths Gully area. The local Wurundjeri tribe would move about the wider Yarra River catchment. Their movements were determined by the seasonally available flora and fauna, and some of the bulbous food they would have eaten, including yam daisies (Murnong in Woiwurrung language) and green-hood orchids (multiple species), are on show during the 1.5km stretch. As you stop to read these signs, or rest by the river, it is easy to quietly reflect. One may think of the deep connections that the Wurundjeri people share with this land. The goldminers might also come to mind, their days spent standing in the cold creek for hours, hoping to finally come face to face with a gold nugget. Once you reach the end of the trail, it doesn’t necessarily mean it’s time to head back. If you continue down Proctor Street for five minutes, you will come across the small township of St Andrews. Here, you will find an old-fashioned pub and other eateries. What’s more, between 8am and 2pm on Saturdays the renowned St Andrews Market will be in full swing where you may find a trinket or have an interesting conversation with a local. So, if gentle walks and encountering wildflowers, eucalypts and subtle changes in ecosystems sound like fun, have a crack at the Smiths Gully walk. Birds identified on the walk: Spotted pardalote, striated pardalote, yellow-faced honeyeater, white-eared honeyeater, grey fantail, white-browed scrubwren, golden whistler, Australian wood duck, superb fairy-wren, crimson rosella, shrike thrush, fantail cuckoo. Plants identified on the walk: Native buttercup, native violet, early Nancy, waxlip orchid, sweet bursaria, prickly moses, dogwood, prickly tea-tree, yam daisy, Austral bear's-ear, blackwood, silver wattle, snowy daisy-bush, narrow-leaf peppermint, swamp gum, candlebark, manna gum, tall greenhood, nodding greenhood, blunt greenhood. A 3km return walk from Peter Franke Reserve in Smiths Gully to St Andrews. Whilst in St Andrews, check out the eateries or visit the St Andrews Market on Saturday. Bring your binoculars for bird spotting and a camera to capture the magnificent scenery. Information boards along the track outline the significance of the area to the Wurundjeri people and the gold mining history of the township. Michael Smith is a trained ecologist who currently works in bush regeneration, habitat engineering and environmental education. He is passionate about community engagement and teaching the importance of biodiversity. 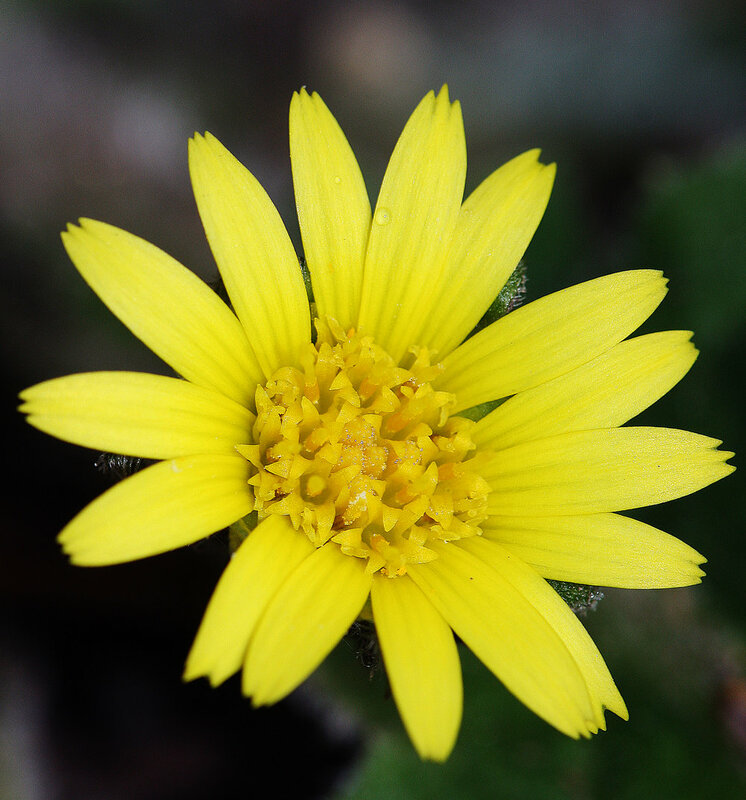 Banner image of a yam daisy courtesy of Michael Smith. Visiting Mt Buller for some skiing or mountain biking this year? Don’t feel like hitting the slopes? If you’d prefer to head out in your hiking boots, this walk will give you a fantastic view of the Victorian Alps along trails in truly beautiful country. Beginning in the alpine town of Mt Buller, head out along Chamois Road with the centre of town behind you. You will come across a staircase leading down to the Village Circuit Track, often used as a cross-country skiing trail. Follow it past the water treatment facility until you hit the unsealed Cornhill Road. This road will lead you around a bend before Cornhill Track takes you up into the bush. From here the route is fairly straightforward all the way to the summit of Mt Stirling. First, however, there’s a long, steep descent into Howqua Gap, where the huts and camping area make a great place to stop and have a rest before tackling the ascent to Stirling. The Howqua Gap Trail, which leads you to the summit, is always fairly clear underfoot and easy to locate, but the steep climbs and descents each way make this a challenging walk. You’ll pass through some extraordinary snow gum forests as you make your way to the Stirling summit, where the trees give way to a beautiful alpine plain. From the summit, watch crows lifting off and butterflies weaving around you, and take a break to recover your strength before tackling the return journey. This is a great walk to build up strength and fitness while enjoying the peaceful quiet of the summits – a good getaway from the noise and bustle of the ski village! A great day’s excursion while staying at Mt Buller. Steep climbs and descents going both ways. Spectacular views of the surrounding mountains. Not advisable for snowy conditions; always carry a map. Tarra-Bulga is one of the lesser known temperate rainforests we have in Victoria, tucked away in South Gippsland in the Tarra Valley. Even the drive to the park feels magical. As you wind your way through the tall cliffs of the valley, water cascades down through the rainforest into the Tarra River, which runs beside you. As the car creeps upwards, the air becomes crisper and you leave the rushing sounds of the river – and the rest of the world – behind you. There are a number of different trails to explore at Tarra-Bulga, as well as picnic and camping areas if you wish to make a day (or two) of it. The Tarra Valley Rainforest Walk is a short and easy stroll to Cyathea Falls, which is a small but beautiful waterfall that you could very well have all to yourself. But possibly the thing I enjoyed most at Tarra-Bulga was simply wondering along the rainforest paths. You will feel dwarfed by the towering mountain ash trees as you wind your way through the thickets of ferns and fallen logs that make up the crowded understory. The air is filled with the sounds of male lyrebirds calling to attract mates, and if you go quietly you may even catch a glimpse of one running across the path – they are everywhere! Fantastic atmosphere - a real escape from the world! This 27-hectare National Trust property is unique. Located in Red Hill on the Mornington Peninsula, the land is 17.5 hectares of remnant rainforest, with the remaining 9.5 hectares gradually being revegetated by volunteers. The two-kilometre walking loop descends from this revegetated area and winds around old gum trees and through a lush fern gully. You then find yourself meandering alongside and over the headwaters of Stony Creek. A variety of fungi are abundant along this walk. 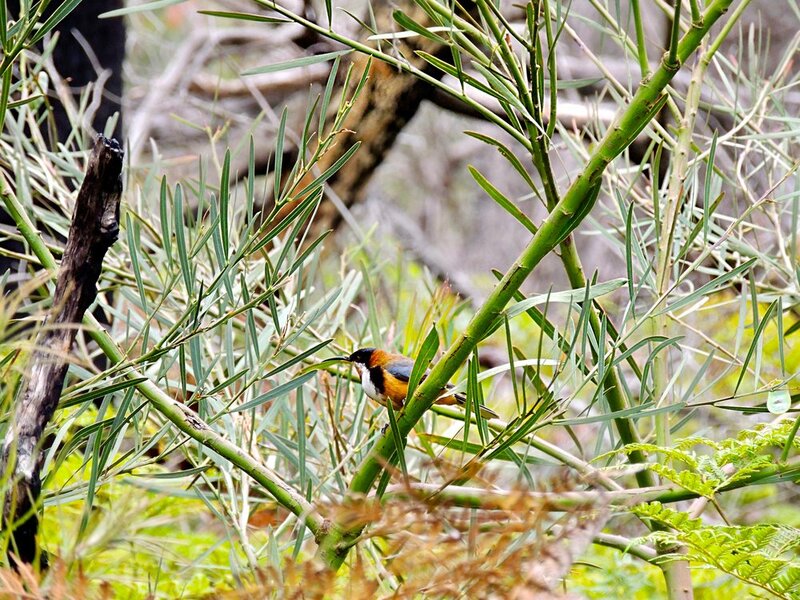 You are bound to see abundant vegetation and birdlife throughout this walk. This land is a haven for flora and fauna to thrive, as it has remained unspoiled. The bushland consists of one of the last remaining untouched areas of a rich, red basaltic soil, which is rare along the Mornington Peninsula. For this reason amongst others, Endeavour Fern Gully has several rare plant species and is a vital source of habitat and food for a wide variety of animals. In this rich habitat there is, unsurprisingly, a significant variety of birdlife. Endeavour is filled with birds humming and whistling everywhere you go. There are crimson rosellas, eastern yellow robins, yellow-tailed black cockatoos, wedge-tailed eagles, and even grey fantails, just to name a few. As you delve deeper into the Gully, you are immersed amongst tall messmate stringybark and the smooth-barked subspecies of manna gum. Along the trail, you will come across a large and remarkable burnt-out hollow of a messmate stringybark. This is believed to have been a place where indigenous people smoked animals for food, such as eels. The Gully boasts some impressive native trees as well as more low-lying flora. For plant enthusiasts, there are at least two indigenous vegetation species that are extremely rare in the area: the Hedycarya angustifolia, a rainforest plant also known as the austral mulberry, and Parsonsia brownii, the silk pod. The latter species is also not apparent anywhere else on the Mornington Peninsula! On our walk, we had the opportunity to explore the Gully with botanist and one of Endeavour’s most dedicated volunteers, Gillian Tolley. She has been looking after Endeavour since 2004 and hopes to gain more insight into the area’s flora and fauna in the near future. Gillian led the way as our team set up cameras, the footage from which will help us to learn more about animal life in the Gully. Endeavour also welcomes more volunteers – so come and get involved in the conservation of one of the Peninsula’s most incredible hidden gems. Camera traps will help us to identify some of the more illusive animals of Endeavour Fern Gully. If you’re looking to be immersed in nature, this tranquil experience is definitely worth a visit! Juliet is the Community Outreach Manager of Wild Melbourne and pursues her interests in natural and social sciences through the mediums of photography, nature expeditions and communication. She also works in conservation and land management, where she takes delight in working with like-minded people who are passionate about our environment. All images courtesy of James Evans. Known as one of Melbourne’s closest waterfalls, Olinda Falls is an easily accessible and ideal spot to visit for those who would love to immerse themselves in the dense rainforest of Olinda’s wetter gullies. Just over an hour’s drive from the northern suburbs of Victoria, you can suddenly find yourself in the incredibly thick, temperate rainforest in the Olinda area of the Dandenong Ranges. This walk is ideal for keen-eyed wildlife enthusiasts and accommodates people of varying fitness levels. From the car park, a 300-metre sloped path lined with giant Mountain Ash trees will guide you to a junction. Here you have the option of visiting the upper or lower falls, both of which have viewing platforms facing the waterfall. The Upper Falls Track is a lot easier than the Lower Falls Track; however, the latter is lengthier and much more beautiful. If exploring both tracks together, it will only take you a little over 30 minutes, providing you don't stop to look at the stunning flora and fauna (which I highly recommend you do!). Remember to look up at the variety of gum and ash trees that dwarf you as you walk by. For a bit of a challenge, you also have the choice of attempting the more rugged Cascade Walk, located near the entrance to the Upper Falls Walk. Here, you will get a greater sense of the untouched rainforest in its natural state. Surrounded by ferns and trees that soar to heights of about 85 metres, this walk is serene and ideal for listening out for a wide variety of bird calls. If you're patient, I've been told you might even see a lyrebird, a wedge-tailed eagle, a swamp wallaby or a short-beaked echidna!